I’ve never had ramen anywhere that swept me off my feet and had me going wowwww…I’d want that again. Probably did not come across the really good ones. Maybe I should start going round and trying out more. Going to the right place for the right one is always important…for anything, for that matter. 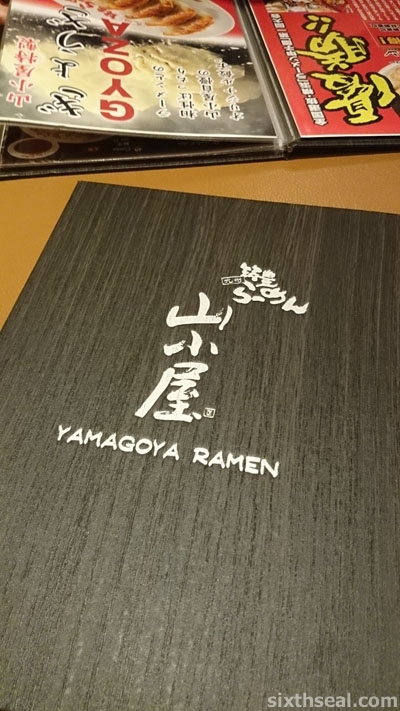 Yamagoya is originally from Japan and they import their pork bones from Japan. You can only get *really good* ramen from a Japanese franchise, where there are very specific requirements (a friend of mine told me the bowls had to be imported from Japan and there’s a QA chef who comes in once a month to taste their broth and ramen) to hold the franchise title. 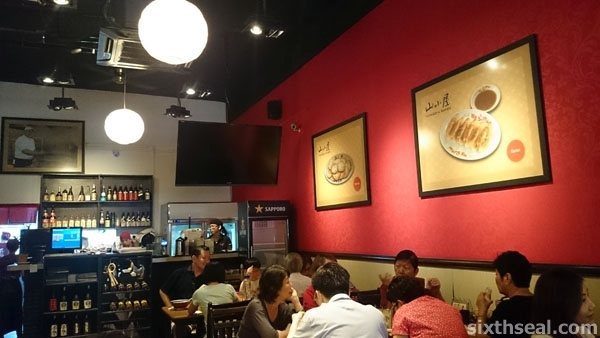 There’s no such ramen shops in Sibu but most of the ramen shops in KL (at least the good ones) are Japenese franchises – Marutama Ramen (Fahrenheit88), Hokkaido Santouka Ramen (Pavilion KL), Goko Raku Ramen (Mid Valley). Note that all the authentic ramen shops are not halal – can’t have a halal ramen shop, it’s not possible with tonkotsu and the basic char siu. We’ll bring you to one next time you come over here mate. I think I like ramen because of the soup only. Oohh wait, and the egg. There’s something about the egg, don’t know how to explain (although I’m an aunty too, cooking eggs all the time for my kids).. I don’t like those char-siew on top of the ramen, taste weird (ok, maybe it’s just me). I only like the meat (chicken or beef), the egg, the seaweed and that piece of “pink fishcake”.. I tried making noodles using miso paste (made it into soup first of course), add in hard-boiled eggs, errr, but did not come near to those in your pictures, haha..
Yeah, I like the onsen tamago too, apparently, it’s not very easy to get right. I know the couple who runs Hokkaido Santouka Ramen (they used to study in Melbourne too) and they told me it took *AGES* to perfect the eggs. They literally had to throw away large batches at first before they could get the proper consistency and since Santouka is a Japanese franchise, they had a chef from Japan to come inspect every month or so too. Hmm…if you don’t like the char siu that comes with regular ramen, maybe you should try the roasted char siu, that tastes more like our char siew. Good job on making your own ramen! BTW, those pink-white things are called narutomaki (or just naruto, like the anime). It’s just surimi (like our “crab sticks” made with flavored fish paste) in a nice color. You can buy naruto at Isetan! 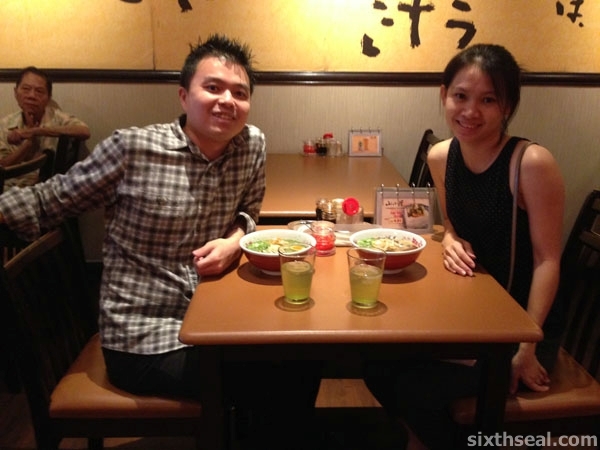 My spouse loves ramen and we have eaten at almost all the specialty ramen shops in One Utama, Midvalley and the Gardens but have never come across Yuzu ramen. It sounds really interesting. I like to eat Yuzu so am very curious as to what the combination of Yuzu and the thick porky broth will taste like. Definitely will go try. Hope it is still available when we go. Thanks for your recommendation. You and Yee Ling look good in the photo! It actually tasted really good! They also had another ramen called “Lemon Ramen” which actually has slices of lemon floating in the broth (!!!). I was quite taken aback at that, would have ordered it for fun if I didn’t see the yuzu ramen. Yuzu works very well in cutting through the intense and robust tonkotsu – I found out that my better half’s broth was too much after having the yuzu broth, the pork bones soup and the yuzu fruit goes very well. No worries, hope it’s still there when you go, I think it should be coz it just came out. Thanks for the kind comments Mun! These are the authentic type of ramen unlike those who served like nissin noodles . I like tonkotsu ramen which came in many types … miso , shio , paitan and so on. Slurp !! It’s the best we can get here unless we take a trip to Japan. I realize that a lot of the Hong Kong style “char chang teng” here also serves “ramen” e.g. Nissin instant noodles so I totally get what you mean! That’s not ramen at all. 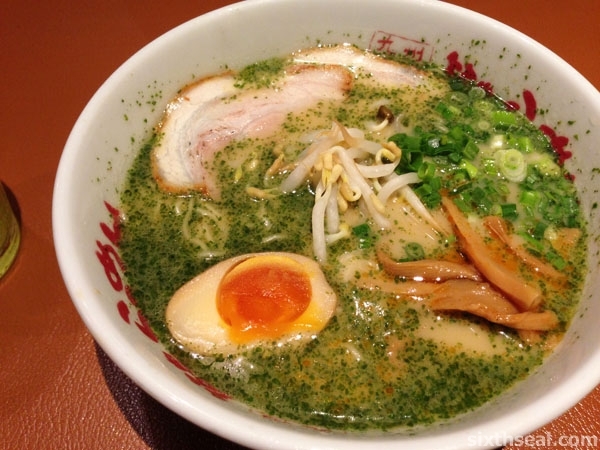 My favorite is just plain shio ramen or kara-miso (a spicy miso broth some Hokkaido places serve). i remember eating here and thinking it was really pricey. lol. then again, i haven’t exactly found cheap ramen. i’m not sure i’ve eaten enough ramen to really know the vast difference. i just know i love how rich the broth always is! I know what you mean – all the Japanese based ramen shops like Hokkaido Santouka, Marutama, Goku Raku all charges about the same for a bowl of ramen – averaging around RM 25. I think that’s the price the market tolerates, considering they import a lot of their ingredients, I’m okay with it. 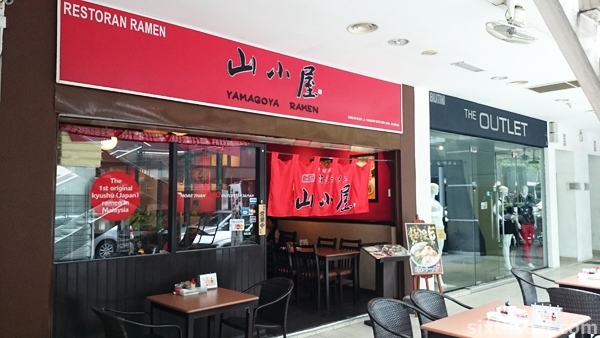 Most of the ramen shops in Klang Valley are good though coz most of them are Japanese franchises who are really invested that the quality of their brand is preserved. Marutama Ramen is known for their 100% chicken broth but they’re not halal coz they serve pork char siu on top of their ramen. I don’t think a ramen shop can be halal and be authentic at the same time e.g. 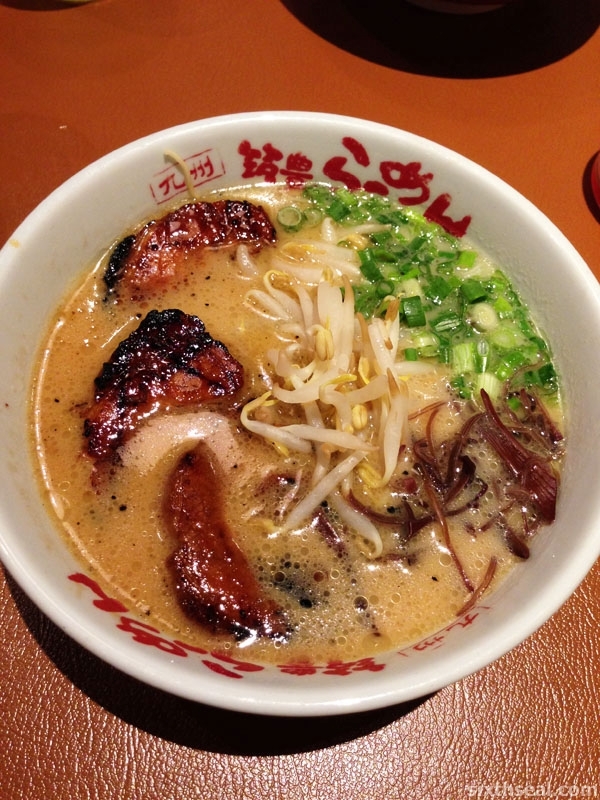 in Marutama’s case, they use chicken broth but all ramen needs char siu topping. RM25 is probably the average price of ramen in Japan as well. You can probably find cheaper ones in the small neighborhood shops. Yeah, been doing a lot of research into Japan too, especially the food scene. The roasted char siu ramen is good too – it’s more intense and flavorful. It’s very robust, like their black garlic ramen bases. I quite liked it, would go back to try the lemon ramen coz it looks quite interesting with floating slices of lemon! I think it may be too filling to order rice to finish up the broth haha! It’s not a full bowl of rice though – Japanese portions are tiny compared to ours – you literally ask for “just a little (bit) of rice” to go with your ramen broth when you’ve finished your noodles. It’s very prevalent in some parts of Japan, that’s where I learned about this custom (and the proper way to eat it). You’ll be served maybe 1/4 of a bowl of rice in a small rice bowl. HB, citrus juice in ramen made it more Thai than Japanese but still good. It really nothing new but fusion. It became popular outside Japan last year – there’s a shop called Afuri that sold *cold yuzu ramen* and what was different about the ramen was that not only was it a cold ramen dish, the yuzu bit was yuzu jelly in the middle of the dish. Ramen shops in Japan has been selling yuzu ramen since the dawn of time (or something like that). It’s a summer thing – the yuzu makes the ramen more refreshing! The ramen looks really good. And very authentic too. 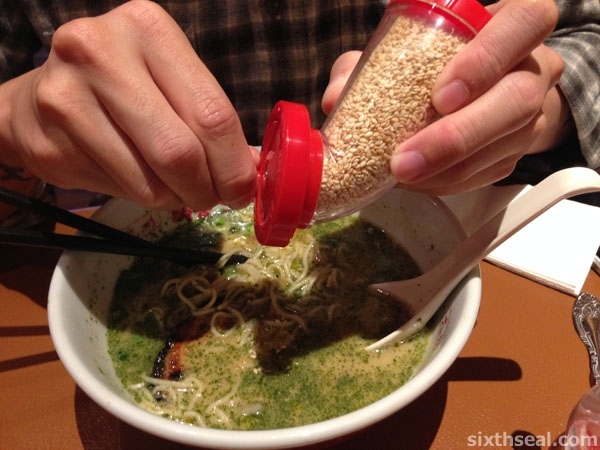 That sesame seed grinder thing is as authentic as you can get. Haha. I need to check out their shop around Tokyo. Haha! We saw the family beside us (Japanese) use the sesame seed grinder *liberally* so I wanted to try it too and it turns out it makes the dish a lot better.